Kia’s new Soul will be exclusively an electric vehicle, and it’s been shown for the first time at the Geneva Motor Show. Cupra’s second car is a coupe-like SUV. It’s the first Cupra not to be based on an existing Seat model. The world’s most powerful road-legal car, with more than 1900 horsepower and top speed of 217mph has been revealed at the 2019 Geneva Motor Show. And it’s electric. The Kia e-Niro is a five-door small electric SUV which will be competing with the likes of the Hyundai Kona electric, Nissan Leaf, Hyundai Ioniq and smaller Renault Zoe. Electric cars are becoming more mainstream, with prices coming down and mileage range going up, making them a realistic proposition for more and more people. These are our favourites. 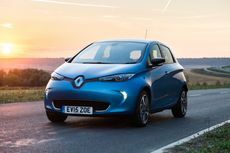 From 9 November 2018, plug-in hybrid grants will be scrapped, and grants towards all-electric cars will be cut from £4,500 to £3,500. We’ve put our curiosity to the test to imagine how seven of the world’s biggest brands, from Amazon to Sony, would revolutionise the electric car industry forever. If you're considering buying an electric or hybrid car, you might have heard quite a few arguments for and against them. We explain the positives and negatives of each, so you can see if an alternative fuel vehicle could work for you. This week, Rachael, Erin and Vicki (REV… get it?) are testing three popular luxury SUVs – Audi Q5, Range Rover Velar, and Mercedes-Benz GLE – based on how people search for them at Auto Trader.